Lutembacher syndrome, first described by Lutembacher, a French physician in 1916 is a combination of a congenital ostium secundum atrial septal defect (ASD) and acquired mitral stenosis (MS). It is more common in females. Traditionally the condition is treated surgically. With the introduction of percutaneous balloon mitral valvuloplasty (PBMV) and percutaneous transcathter closure of ASD nowadays, both diseases can be treated with percutaneous transcathter therapy in suitable patients and in those who are reluctant to the surgery. A 42-year-old female patient presented to our outpatient department in 2009 with a history of dyspnea on exertion (from New York Heart Association class III), palpitations, and decreased exercise tolerance of 2 years duration. Physical examination of precordium showed tapping apical impulse, loud first heart sound, fixed splitting of the second heart sound, loud P2 component of second heart sound, opening snap, grade II/IV mid-diastolic rumbling murmur at the apex, grade 3/6 ejection systolic murmur at the pulmonary area and mid-diastolic murmur (MDM) at the tricuspid area. Twelve lead electrocardiogram showed sinus rhythm, incomplete right bundle branch block and biatrial enlargement. Transthoracic echocardiogram (TTE) showed enlargement of both atria and the right ventricle, severe MS with a mean diastolic gradient of 18 mmHg and maximum diastolic gradient of 28 mmHg across the mitral valve and valve area of 0.7 cm 2 calculated by planimetry. The Wilkins echo score was 6. Mitral regurgitation (MR) was trivial, tricuspid regurgitation was mild and the right ventricular systolic pressure was 46 mmHg. TTE also showed 12 mm ostium secundum ASD with left to right shunt. Transesophageal echocardiogram (TEE) demonstrated enlargement of both atria and the right ventricle, severe MS with mean diastolic gradient of 14 mmHg and maximum diastolic gradient of 27 mmHg, trivial MR without any clot in the left atrium and atrial appendage and 11 mm ostium secundum ASD with left to right shunt with adequate rims. Her coronary angiography was found to be normal. After explaining the treatment options, patient was taken up for transcatheter treatment. Through right femoral vein approach mitral valve was crossed and dilated with Accura PBMV balloon catheter (Vascular Concepts Limited, UK) up to 24 mm [Figure 1]a] after administering heparin (5000 U) under TTE guidance. The mean gradient fell from 18 mmHg to 4 mmHg after mitral balloon valvotomy. The mitral valve area increased to 2.0 cm 2 and a mild MR was observed. The stretched diameter of the ostium secundum ASD using a sizing balloon catheter was found to be 12 mm. 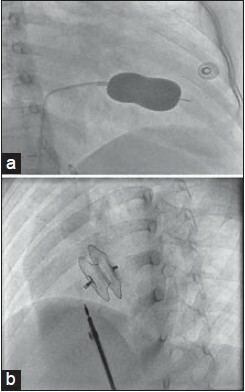 Under TEE and fluoroscopy guidance a 14 mm Cocoon septal occluder (Vascular Innovations Co. Ltd., Thailand) was deployed across the ASD without any residual left-to-right shunt [Figure 1]b]. At 10 th day follow-up, the patient had good symptomatic improvement. After that, the patient was at regular 3-month follow-up and remained asymptomatic. At 5 years follow-up, TTE showed mitral valve area of 1.59 cm 2 by planimetry [Figure 2]a], mild MR and without left-to-right shunt across interatrial septum [Figure 2]b]. Lutembacher syndrome refers to a rare combination of ASD and MS. The incidence of ASD in patients with MS is 0.6-0.7% and the incidence of MS in patients with ASD is 4%. In the past Lutembacher syndrome has been misdiagnosed or over diagnosed because of the presence of a mid diastolic murmur (MDM) in patients with ASD, until it was recognized that the MDM was due to excessive flow through the tricuspid valve from the left-to-right shunt across the interatrial septum. The incidence of atrial left-to-right shunt following PBMV (iatrogenic Lutembacher syndrome) is 11-12%. In most of these patients, the magnitude of the shunt was small, and the defect usually decreased in size or even closed over the ensuing months. This is a rare condition, and few case reports of percutaneous treatment of Lutembacher syndrome are available. Almost all reported immediate successful results. Because there is no long-term follow-up data available, we could not comment on the long-term prognosis of this therapy. Repeat PBMV can be performed in these patients if there is a recurrence of severe MS. However, since the trans-septal approach cannot be used due to the Cocoon septal occluder, PBMV can be done using the retrograde nontrans-septal approach in these patients. To the best of our knowledge, this is the fifth reported case of Lutembacher syndrome in India to undergo a combined percutaneous treatment intervention. Our case shows the successful and sustained benefit of percutaneous treatment of Lutembacher syndrome even after 5 years. Percutaneous transcatheter closure of ASD and mitral valvotomy is the treatment of choice for Lutembacher syndrome until and unless the lesions are incongruous for the procedures. 1. Perloff JK. Atrial septal defect. In: The Clinical Recognition of Congenital Heart Disease. 4 th ed. Philadelphia: W. B. Saunders; 1994. p. 233-99. 2. Ahmed WH, Al-Shaibi KF, Chamsi-Pasha H, Abdelmenem A. Non-surgical correction of Lutembacher syndrome. Saudi Med J 2003;24:307-8. 3. Cheng TO. Percutaneous Balloon Valvuloplasty. New York/Oxford: Igaku-Shoin; 1992. p. 269. 4. Vasan RS, Shrivastava S, Kumar MV. Value and limitations of Doppler echocardiographic determination of mitral valve area in Lutembacher syndrome. J Am Coll Cardiol 1992;20:1362-70. 5. Cheng TO. Coexistent atrial septal defect and mitral stenosis (Lutembacher syndrome): An ideal combination for percutaneous treatment. Catheter Cardiovasc Interv 1999;48:205-6. 6. Ruiz CE, Gamra H, Mahrer P, Allen JW, O'Laughlin MP, Lau FY. 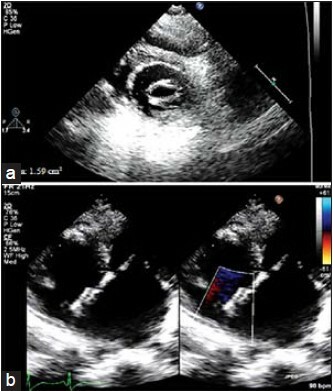 Percutaneous closure of a secundum atrial septal defect and double balloon valvotomies of a severe mitral and aortic valve stenosis in a patient with Lutembacher's syndrome and severe pulmonary hypertension. Cathet Cardiovasc Diagn 1992;25:309-12. 7. Joseph G, Abhaichand Rajpal K, Kumar KP. Definitive percutaneous treatment of Lutembacher's syndrome. Catheter Cardiovasc Interv 1999;48:199-204. 8. Chau EM, Lee CH, Chow WH. Transcatheter treatment of a case of Lutembacher syndrome. Catheter Cardiovasc Interv 2000;50:68-70. 9. Aroney C, Lapanun W, Scalia G, Parsonage W. Transcatheter treatment of Lutembacher syndrome. Intern Med J 2003;33:259-60. 10. Ledesma M, Martinez P, Cázares MA, Feldman T. Transcatheter treatment of Lutembacher syndrome: Combined balloon mitral valvuloplasty and percutaneous atrial septal defect closure. J Invasive Cardiol 2004;16:678-9. 11. Shen XQ, Zhou SH, Zhou T, Qi SS, Fang ZF, Lv XL. Transcatheter treatment of Lutembacher syndrome. Chin Med J (Engl) 2005;118:1843-5. 12. Ho CL, Liang KW, Fu YC, Jan SL, Lin MC, Chi CS, et al. Transcatheter therapy of Lutembacher syndrome. J Chin Med Assoc 2007;70:253-6. 13. Shabbir M, Ahmed W, Akhtar K. Transcatheter treatment of Lutembacher's syndrome. J Coll Physicians Surg Pak 2008;18:105-6. 14. Ozdemir AO, Kumbasar D, Dinçer I, Atmaca Y. Percutaneous treatment of Lutembacher syndrome: A case report. Turk Kardiyol Dern Ars 2010;38:47-9. 15. Behjatiardakani M, Rafiei M, Nough H, Rafiei R. Trans-catheter therapy of Lutembacher syndrome: A case report. Acta Med Iran 2011;49:327-30. 16. Bhambhani A, Somanath HS. Percutaneous treatment of Lutembacher syndrome in a case with difficult mitral valve crossing. J Invasive Cardiol 2012;24:E54-6. 17. Malviya A, Saha SK, Mishra A. Substantive treatment of Lutembacher's syndrome by the trans-septal puncture technique: A case report and review. Heart Asia 2013;5:222-4. 18. Vadivelu R, Chakraborty S, Bagga S. Transcatheter therapy for Lutembacher's syndrome: The road less travelled. Ann Pediatr Cardiol 2014;7:37-40. 19. Stefanadis C, Stratos C, Pitsavos C, Kallikazaros I, Triposkiadis F, Trikas A, et al. Retrograde nontransseptal balloon mitral valvuloplasty. Immediate results and long-term follow-up. Circulation 1992;85:1760-7.